Many of us made bead bracelets and necklaces when we were little. Often they were the kinds of little crafts that we did in school or at camp. 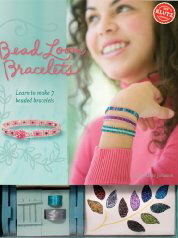 Now, with the help of this kit, you can take your bead bracelet making to a whole new level. The kit includes everything you need including a mini loom, thousands of beads, beading thread, beading needles, design paper, and a handbook. In all there are eight projects to try and each one teaches the crafter a new skill. The author begins by describing the tools and how to set up and use the loom. Next the author starts the crafter off with a Basic Weave bracelet. Clear instructions with illustrations show the crafter how to begin the project and how to complete it. Photographs show what the completed bracelet will look like. The next project is a little more complicated and once again the author walks the crafter through the process. If you want to make a bracelet with a fancy edging that comes next. Though the process is delicate and takes time, crafters who like to work with beads and who enjoy experimenting with color and patterns will love this kit. Tips and tricks can be found throughout the book and the instructions are easy to follow. This kit would make a wonderful gift for young people who like to make beautiful things with their hands.